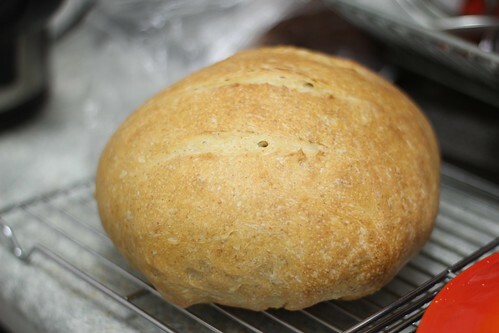 With this entry, I have gone off the one sourdough recipe I have been making and found others. Basically, I am doing the turn and fold method with the long bulk fermentation for all my breads now. It is mostly working too and I love eating my sourdough. I bake it about once a week now, often prepping the dough in the morning and evening for first and second proof, then baking at night. I do not cut the bread until the next morning. 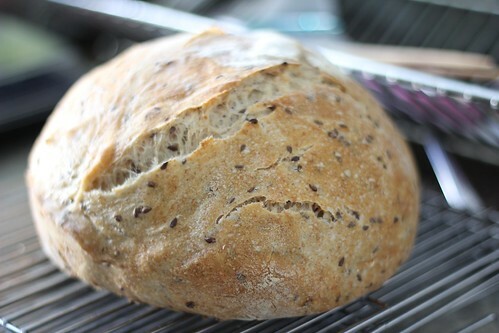 In 2012, I created my own sourdough starter from scratch. It used organic flours (rye, kamut, whole wheat, spelt) and distilled water. I kept the sourdough alive and tried to make sourdough bread half a dozen times. However, it was only mildly successful one time when I made a Olive Sourdough Fougasse. I basically gave up on sourdough until recently. It’s been a personal challenge for me as a baker. I put the sourdough starter in the fridge and would occasionally feed it, but it has lived in hibernation since 2013. In fact, I had a bit of a hard time reviving it when I took out for this experiment. Currently, I feed my sourdough mostly with a mix of AP, whole wheat, and rye flours. I find rye flour really makes an active starter. I will also the starter with kamut or spelt if I have it on hand. I use distilled water some of the time, but I have been mixing it with cool boiled tap water. Luckily, I have access to one of the best municipal water systems in Canada. A couple of months ago, a neighbor and I became friendly over our mutual love of food. She shared with me this no knead sourdough recipe from the Clever Carrot. She also gave me a loaf to try. The whole no-knead process and the many tips (love the water glass float taste) convinced me to try the recipe. Why do I love sourdough? I do love the tangy taste of it. Second, it lasts longer than standard bread loaves. I do not consume a lot of bread. I make bread because I love to bake it, but rarely do I ever crave it. I am not a carbs person so a loaf of bread takes me a awhile consume. A standard 1kg loaf like the one below will take me on average 4-6 days. Loaves from commercial yeast including the other No Knead bread recipe I use get dry and hard within two days. This is why I always have to freeze those loaves, but with sourdough, they remain mostly soft in room temperature for days. I love that. Finally, I do believe sourdough is easier to digest and probably better for you. Note: I use Canadian All Purpose flour which has higher gluten levels than standard American or British AP flours. I almost always used AP flour over bread flour for bread including all my previous Jim Lahey No Knead bread attempts. I bought bread flour for this experiment though. In the end, I feel AP is enough. 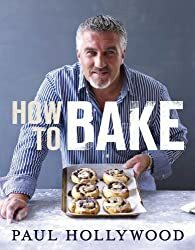 This is the first of three Paul Hollywood books I will review. As someone who loves baking, most of my cookbooks are focused on baking from the sweet to savoury to bread. This book covers that. It is the British edition of the book which I ordered from Book Outlet. I do prefer the UK editions of cookbooks. What is a bit inconvenient is that Hollywood loves Stilton cheese which I can’t eat due to a penicillin allergy. Époisses cheese is featured once in this book too and it is hard to source here. As a UK book, there other things such as apricot jam, glace cherries, and dried peel. The pies and tarts section is more British as well. I love British baking so I adapt and substitute when necessary. This book is suitable for novices, but it has recipes and sections for more adventurous bakers. There are sections for Sourdough and Pastries. My relationship with the former is contentious and most of the sourdough recipes makes 2 loaves which is too much for me. There are recipes for croissants, danishes, and brioche. I’ll tackle the brioche one day. There are couple of non-baking recipes such as those breads or “bakes” you can make on the stove: chapatis, crumpets, and pancakes. On the whole, I’d recommend this for bakers who are keen on breads and expanding their repertoire. It’s not a cookies/biscuits kind of book. None of Hollywood’s books are. They are a bit more advanced than some standard cookbooks. This was my first Hollywood book and I continue to love his cookbooks from the photographs, instructions, and to the binding. Prose and Writing: Each section has an introduction page which gives some good pointers. Every recipe has a little blurb which not extremely useful, but nice. Hollywood is not super effusive in his writing. Technique and Teaching: Lots of information for bakers with a bit of experience. He teaches various bread shapes: plaits, spirals, loaves, couronnes, and so forth. I’ve learned many bread and baking tips from Paul Hollywood including kneading with oil and simple things like how to mix, what tools to use, etc. Photography and Layout: This book stands out because of the instructional photos. Great photography all around. Other Book Notes: I really liked the overall binding of this book. It’s a hard cover, but Hollywood’s books tend to be less glossy and lighter. Usefulness Factor: 5/5. If you’re serious about baking, bread, and viennoiseries, this a useful book. Inspiration Factor: 4/5. Croissants and Danishes! Focaccia – Amazing. As if you bought it in the store. Cholla (Challah) – This book includes pictures and instructions on how to do an eight strand/plait. Very good challah recipe. 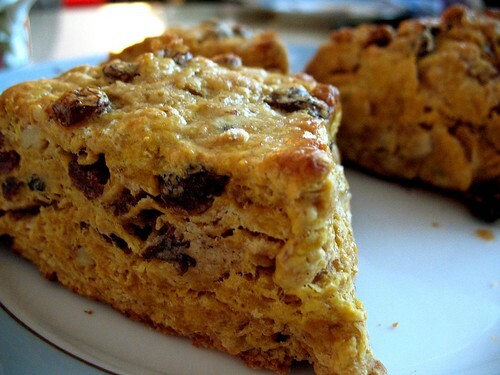 Scones – Uses bread flour which I’m not too keen on with scones. They are alright. Heat your oven to 180°C. Line a 1kg loaf tin with baking parchment. In a large bowl, beat the butter, 180g of the sugar and the vanilla extract together until the mixture is light and fluffy. Beat in the eggs, one at a time, then sift the flour and baking powder over the mixture and fold in with 2 tbsp of the milk. Spoon two-thirds of the mixture into the prepared loaf tin – it should three-quarters fill the tin. Sift the cocoa over the remaining third of the mixture and fold in, together with the remaining 20g sugar and the last of the milk. Spoon the chocolate mixture over the cake mixture in the tin, then run a fork through both mixtures, gently swirling the two together to create a marbled effect. Bake for 55-70 minutes, until the cake shrinks slightly from the sides of the tin and a skewer inserted into the centre comes out clean, testing the cake after 55 minutes. Remove the cake from the tin and leave to cool on a wire rack. Once cooled, dust with icing sugar. Recipe Review: While still good, this is not one of the best recipes in the book. A 1kg loaf tin is 2lb loaf tin or by some sources, a 9×5. I have an 8×4 metal tin and a 10×6 silicone loaf mold. 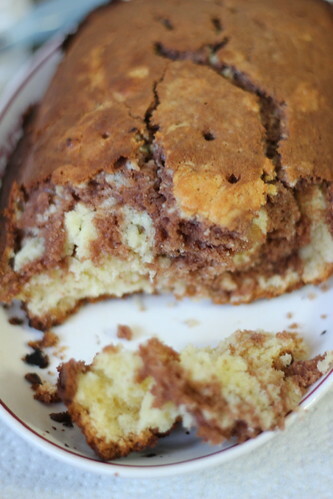 I used my 10×6 silicone loaf mold which makes the cake batter more shallow. In Hollywood’s Bread book, he writes that a standard 1kg loaf tin is about 27cm x 13cm x 7.5cm which would make it almost a 10×6. 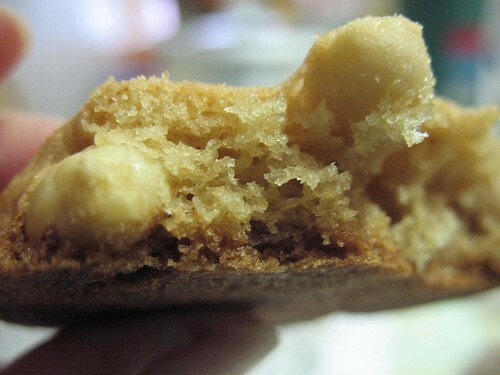 To be safe, I increased the temperature by 25 degrees and decreased the baking time. I checked it around 33 minutes because of the smell. It was not done, but it was done about ten minutes later. I really like using the silicone mold because I don’t have to grease it or use parchment paper, but it throws off the baking time and makes loves lower than they could be. I need to buy a 9×5. This recipe required a lot of beating which was good for the workout. Sugar was 160g or 15g for the cocoa portion. I found it hard to marble though which is why my loaf ended up looking ugly. Taste was good and if I kept the sugar at 200g, it would still have been alright since I think Hollywood’s recipes are less sweet than some others. This recipe was for the most part easy and I did enjoy the result. Unlikely to make again, but I still adore this cookbook. ETA: Four days later and I have to say that I gifted some of the loaf to my parents and as they ate through it, the marbling got better. Taste was still good within the first three days too. I’d make the loaf again actually, but using a hand mixer next time. This is a bread technique I’ve wanted to try for some time. I actually like kneading. I started doing this in January when I moved into an apartment with a kitchenette and almost no counter space. I have wanted to own a dutch oven for a long time too. Yeast: Unless otherwise stated, I used Fleischmann’s Traditional Active Dry Yeast. I didn’t proof it before using. Salt: Fine sea salt or kosher salt. Water: Room temp distilled water or room temp boiled tap water. I didn’t measure my water as I would always just pour enough to get a sticky dough. Proofing: My first rise was usually 18 hours or more, but due to my schedule, I’d often have a very short second rise for about an hour. I found no significant difference with a longer second rise. Non-stick Grain: I experimented with flour, wheat bran, cornmeal, oats, and polenta. Plain or WW flour was best because cutting made a mess of the others. Dutch Oven: Lagostina 4-qt round dutch oven from Canadian Tire. I could not afford a Staub or Le Creuset yet; I would have to order a Lodge one online. The Lagostina is enameled on the inside unlike the Kitchen Aid and it had the dimpled lid (perfect for steam) unlike the Cuisinart. The only downside is that it’s a bit wider than I like and not 4″ high, but that’s alright for now. 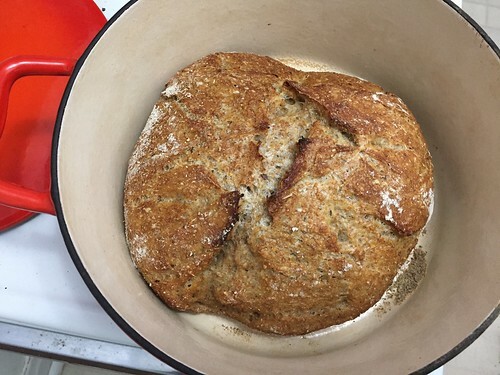 Lid: I usually covered the bread for about 15-20 mins and uncovered for another 10-15. This is a staple for one of my friends. She’s a domestic goddess and excellent at baking. I’ve had this cake before and I did mess up on my own versions only because I realised my dish is too small. This is a cake that requires no solid chocolate which is good if you all you have on hand is cocoa powder and you don’t want to chop up chocolate or can find mass quantities of chocolate chips (why is it that I can only buy it in 100 grams bags here?). I think this is a pretty inventive cake probably from an old vintage cookbook of my friend’s mum. It was a hit at the birthday I baked this for. As usual, I cut out a lot of sugar, and while I usually use brown sugar in my recipes, I followed the recipe and used white for this one. Lots of lovely dark brown sugar make this baked good. 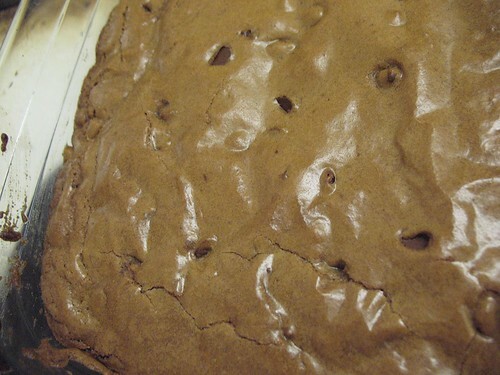 Chocolate chips made this extra gooey. The top skin was lovely. As usual, I cut a lot of sugar and some oil. I used a mix of margarine and sunflower and grapeseed oil because I did not have canola on hand at the time. They were chewy and sweet. 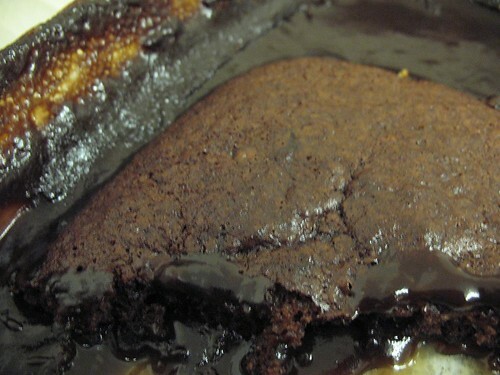 Nice and decadent, but not as much as brownies, but the chocolate really adds a great touch. As I am not someone with a sweet tooth (funny since I bake so much), I would definitely cut the sugar down further. The original recipe used pecans, but we could not find a good source of them in the short time so we used a mix of walnuts and home roasted peanuts. For the fat, we used canola oil. It worked pretty well. Adapted from archaic Better Homes and Garden cookbook, taken from a friend who owns said cookbook. 1. Mix the butter, sugars, egg, and vanilla together. 2. In separate bowl, mix flour, baking soda, baking powder, salt together. Slowly mix the dry mixture into the wet. Finally, add the pecans and fold into batter. 3. Spoon onto baking sheet. These cookies are on the smaller side. 4. Bake at 375’F for 10 minutes. Pumpkin season is over, but do you have a can of puree? If not get some for this wonderful tea time snack. This was my third Joy of Baking recipe. I am consistently pleased with the results from the recipes I have made. All of them have been delicious and well thought out. 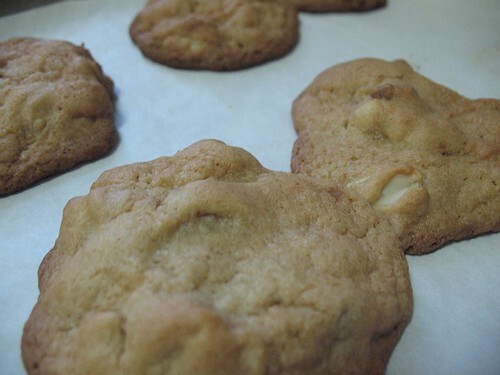 This my second time I’m making a recipe from JoyofBaking, and I’ll make another recipe from the site today. I think it’s consistently delivered good results. This loaf is really good. The lemon glaze and the zest give the loaf its quality result. The hand mixer is in storage so I used my arms. That was not good overall. I also think you could use less butter than called for in the recipe. As usual, I reduced the sugar.